High above the Potomac River, 16 miles south of the nation's capital, lies Mount Vernon, George Washington's estate. His beautiful mansion, which he fashioned to reflect his Virginia gentleman status, stands restored to its look in 1799, the year he died. So, too, are his gardens, the slave quarters, the grist mill, the distillery, even a small portion of his much-loved farm. A museum and education center, furnished with objects from his times (including his dentures, which are not wooden) and multimedia presentations of his life, opened in 2006. And he is buried here, a wreath placed ceremonially on his grave daily during high season. But something has been missing. Where is the library for the father of our country? Washington—unlike most Founding Fathers—never attended college, and he compensated by reading, accumulating some 1,200 titles on a wide range of subjects. He intended to build a structure to house his books and his papers, which, he wrote, "are voluminous and may be interesting," but never got around to it. On Friday, the Mount Vernon Ladies' Association—which rescued a dilapidated Mount Vernon in the 1850s and turned it into a showplace that draws a million visitors a year—filled that void, making the first president the latest to have a presidential library. Respectfully sited across the street from the estate, on 15 acres of land Washington once owned, the new 45,000-square-foot facility is intended to serve both as the repository of Washington's books and manuscripts and as a scholarly retreat, think tank, leadership training center and educational outreach organization that spreads the wisdom of George Washington world-wide. "The message is very clear," said Curt Viebranz, president of Mount Vernon. "Washington was a man of action, an entrepreneur, a man of character and civility, who understood power and had the willingness to give it up. He could see that his enduring legacy was better served by stepping down. We would not have this republic today if not for him." Washington's library (officially, the Fred W. Smith National Library for the Study of George Washington) is modern and technologically up-to-date, but the architects, Ayers Saint Gross, of Baltimore, and interior designers, MFM Design, of Bethesda, Md., have produced an elegant U-shaped building that honors the past, too. The exterior of the core is sandstone and limestone; the wings are clad in stucco. Lots of glass—in floor-to-ceiling windows and skylights—provides a connection, and frequently a view, to nature. The interior is laden with a surprising choice: millwork made of American Sycamore, a red-brown wood that grows at Mount Vernon but has not, until now, been known for its decorative qualities. 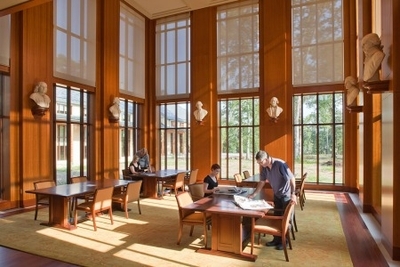 At the building's heart, just beyond an entry lobby, is the light-filled, wood-paneled, two-story reading room. 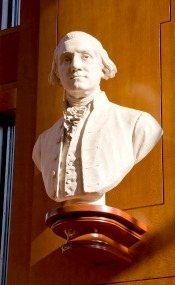 In a nod to a feature common at many renowned 18th-century libraries, six commissioned busts—of Washington, John Adams, Benjamin Franklin, Alexander Hamilton, Thomas Jefferson and James Madison as they would have appeared in 1785—preside on mahogany brackets at a height of 9 feet. Nearby, in two rare-book rooms, are 19th- and 20th-century books and objects commemorating Washington, plus his letters and documents. Beyond lies an oval-shaped vault, adorned with a 6-foot, pewter-toned sculpture of Washington's bookplate (the family crest and Latin motto, which translates to "the end is the result of the actions"). This vault contains "the rarest," Mr. Viebranz says—about 62 titles, in 103 volumes, that Washington actually owned. That number is so small because a nephew, George Corbin Washington, sold a large portion of the books in 1848; many are now in the collection of the Boston Athenaeum. To compensate, the Ladies' Association has been acquiring period titles matching Washington's inventory. Last year, their determination showed when Washington's copy of the Acts of Congress—the Constitution, the Bill of Rights and other legislation passed by the First Congress, marked with his annotations—came up at auction with an estimate of $2 million to $3 million. Though the price soared to more than $9.8 million, they bought it. It's in the vault. To the right of the reading room, through an open-stacks array of modern books about Washington and the founding era, is the research-and-programming wing, with offices for the newly hired director, historian Douglas Bradburn, visiting scholars and staff, and offices for "The Papers of George Washington" project, a decades-old effort that is slowly publishing his documents. To the left, through a reception area whose signature feature, a rounded gold-toned limestone wall, is etched with 16 titles from Washington's books, is the education, or leadership, wing. It contains five meeting rooms of various sizes; the last seats 100 and is outfitted with an 8-by-18-foot microtile video wall that can show eight feeds at a time in high definition. Each wing has its own potential. In scholarly matters, Mr. Bradburn says there is much yet to learn about Washington, citing as one example his role as a business leader: He was a pioneering farmer who was among the first area planters to switch from tobacco to wheat; a land speculator and developer; and the founder of a distillery that was, when he died, the largest in the U.S. Mount Vernon has chosen seven research fellows for the current academic year and plans to select educators to develop innovative lesson plans. Throughout its efforts, the library will foster a multidisciplinary approach, looking at science, the arts and the whole "Age of Revolutions" in that era, for example. In addition to hosting symposia, lectures and events, it will deploy the Internet to disseminate educational materials. The leadership wing—where Washington provides a sterling role model—has a different role. Here, government officials, domestic and foreign; the military; corporations and other audiences may take custom-designed training courses in leadership. The wing may also, occasionally, provide a neutral place for politicians to try to resolve sticky issues—as it did last October, when the bipartisan "gang of eight" senators met to discuss ways to reduce government debt, unsuccessfully. With those ideas as a basis, it will be up to Mr. Bradburn, who arrived at Mount Vernon only in mid-August from Binghamton University of the State University of New York, to make Washington central to today's generations. "There's a low-level sense of Washington out there, but we can do more," he says, warming to the potential and adding: "George Washington belongs to the world."